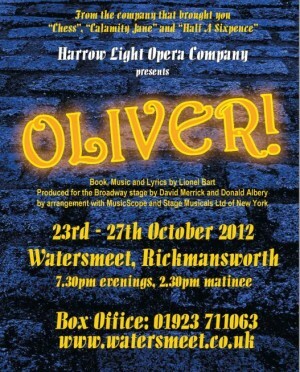 In celebration of the 200th anniversary of Charles Dickens' birth, Harrow Light Opera Company is proud to present Oliver, Lionel Bart’s popular tale of an orphaned boy from the workhouse asking for more. Considered by some to be one of Dickens' greatest works the company, of over fifty adults and children, is busy rehearsing for their show which is being performed at Watersmeet in Rickmansworth from 23rd to 27th October at 7:30pm with a Saturday Matinee at 2:30pm. The company, which was founded in 1944 has performed over one hundred musicals and concerts and were delighted when Barry Cryer OBE became their patron a year ago. You can book your tickets by phoning the box office on 01923 711 063 or visiting www.watersmeet.co.uk and why not take advantage of the Special Saver Ticket Deal on Tuesday or Wednesday night where you can purchase two adult and two child tickets for just £44. The musical includes well known tunes such as “Food Glorious Food,” “Consider Yourself,” “Oom Pah Pah” and “Pick a Pocket or Two” and really is one for all the family so book your tickets now!